Forgive the delay on this week's article, life got a bit busy over the past few days with the hurricane coming through town and a few other distractions. But we're back in business, likely just ahead of your local shops opening. For what it's worth, my current days have been filled with the self-published wonders of Steve Ditko - the artist responsible for characters like Spider-Man and Doctor Strange, among other notable creations at Marvel and DC. I recently picked up a swath of the work he's been doing since the 90's, comics he's produced in conjunction with publisher Robin Snyder, and given that he's turning 90 this November - it's incredible that he's still producing this volume of product. I've only had a chance to read a little bit here and there, but these comics are almost uniformly anthologies, as Ditko seems most comfortable in the shorter story arena, dedicating about 5-6 pages to each of his new creations along with returning favorites like Mr. A. It's worth noting his work is very heavily influenced by objectivism and the philosophy of Ayn Rand, you may consider that a feature or a bug depending on your respective viewpoint. He also has a concurrent reprint series that reproduces a nice batch of both his earlier independent work from throughout the 70's-90's as well as public domain stories he pencilled for Charlton Comics in the 50's, even resuming some of their titles for the cover such as: Out of this World and Tales of the Mysterious Traveler. If you want to get a sense of what he's doing today, check out the following two articles by Joe McCulloch, one detailing a big batch of his *new* comics, and another giving a briefer overview of the reprint model. It's fascinating reading. I may have more to say on the subject in the future after I've actually read more of this stuff. Hellboy & the BPRD 1955 - this week's Mignolaverse pick. I enjoyed last month's initial 1955 entry more than I have recent issues in this series, so I'm excited to see what Roberson and Mignola have cooked up this time and if this all leads to Hellboy's year-long bender in Mexico. Hard Boiled h/c - Ooh! Geof Darrow art with Frank Miller writing. This is one of those must-reads from the days of Miller's initial breaking away from both Marvel and DC. Not sure how it's aged over the years, but it was pretty impactful on Kyle during his formative comics reading years. You can draw a straight line between what Darrow does here and artists like Frank Quitely, Nick Pitarra and Aaron Kuder. Dark Knights Metal #2 - I think this Metal series of books has been the most fun I've had reading a superhero event comic in a while. This series, despite its exterior appearances in ancillary marketing, is actually a pretty neat love-letter to DC continuity...I mean what else is a series built around the Challengers of the Unknown, Hawkman, Dream of the Endless and major elements of Final Crisis going to be? We'll see where it goes from here as its outreach expands into crossovers, often where these things falter. 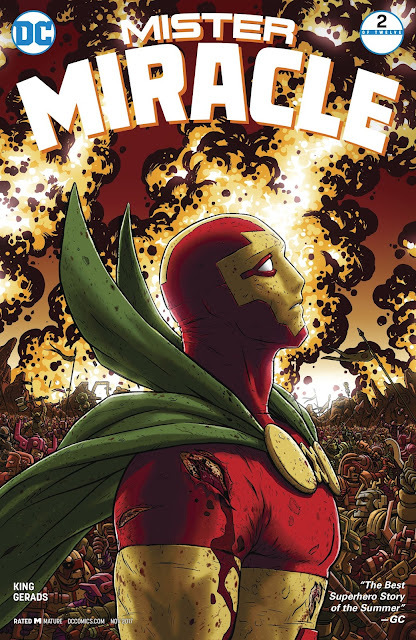 Mister Miracle #2 - The follow-up to the talk of the comics blogosphere last month. This issue focusing on the war that's raging between Apokolips and New Genesis, which plays nicely against the more intimate story that King and Gerads are weaving. There's a good chance DC has a real perennial on their hands with this one, the sort of thing neither of the Big Two have produced much of in recent years. Kill or Be Killed #12 - More Phillips and Brubaker, which basically speaks for itself. This series has really come into its own with its second arc forward. Happy to read more, as I usually am from this creative team. Spy Seal #2 - The second issue of one of Image's most unique titles, from one of the rare cartoonists they work with regularly. This series is an absolute blast of fun, and while I'm desperate to read it in the Euro format to which is clearly is screaming to be presented on, I'll take what I can get - exciting globe-hopping adventure. Slasher #4 - Another bit of self-publishing from Charles Forsman whose comics are a wonderful little bridge between the indie world and grittier genre fare. Not for the faint of heart, but every Forsman comic is a must-read.